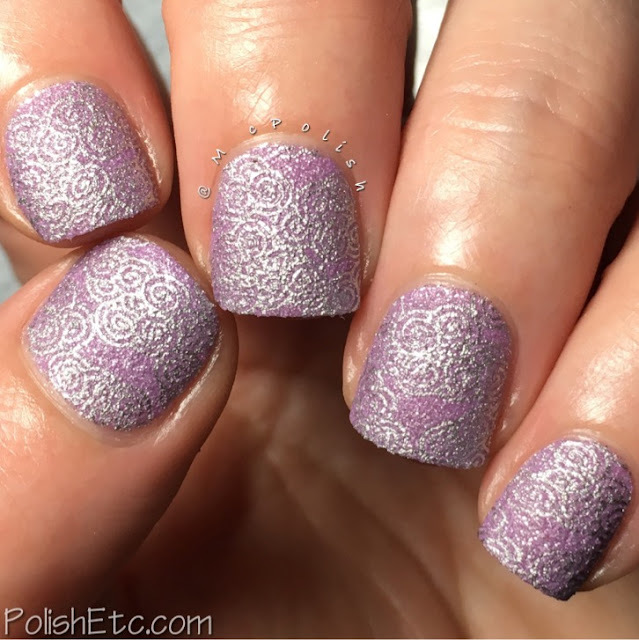 Violet Nails for the #31DC2018Weekly - Polish Etc. For this manicure, I have a base of Zoya's "Stevie" which is a light lavender textured polish with added silver sparkle. This shade is perfection. It's feminine, dainty and a perfect pastel for Spring. But the added texture and silver sparkle gives it a slight edgy feel. Like "Yea, I wear pastels. But I also love to rock!" 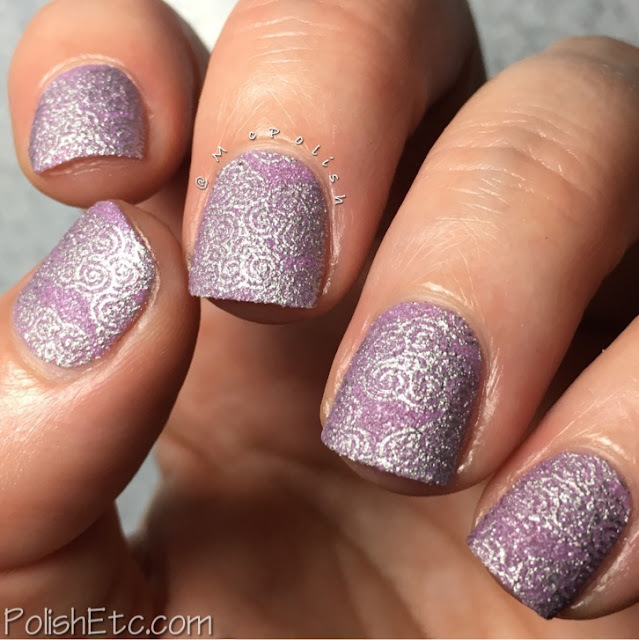 I stamped over two coats of Stevie with Sally Hansen Silver Sweep (from the Insta-dri line) using a design from MoYou London plate Suki 08. It is a stylized cloud design. The silver sparkle in the polish doesn't show up great in my photos but it twinkles on the nail in real life. Yep...I dig this mani. If you want to do this look yourself, stop by Zoya during the month of April to take advantage of their Earth Day Exchange Sale! 50% off my favorite mainstream brand! Yes, please! 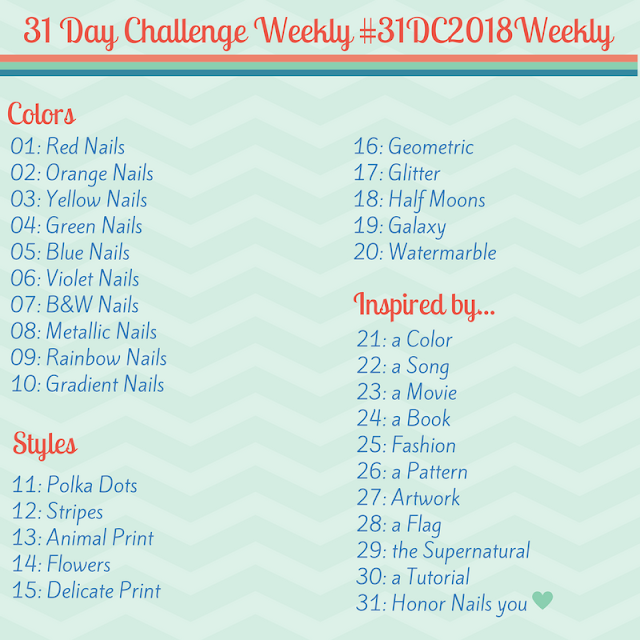 If you want to keep up with everyone else doing the challenge this year or want in join in yourself, be sure to use the tag #31DC2018Weekly on Instagram, Facebook and Twitter. Plus...be sure to check out what my German bestie, Lotte, is creating each week on her blog! You just have so much better ideas than me :) And I still haven't tried stamping over texture. That's been so long on my list now. It really comes out way better than you think it will. You gotta try it.